The colors in this rug are vibrant and stunning. Good thick quality and feels plush under my feet. Brightens up the room beautifully! I have this rug in a smaller size as well and both compliment our honey colored wood floors. 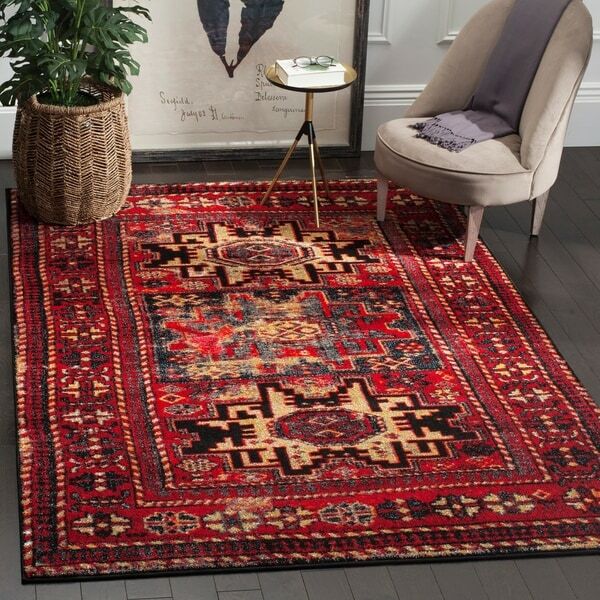 Safavieh Vintage Hamadan Traditional Red/ Multicolored Distressed Rug - 5'3" x 7'6"
Safavieh Vintage Hamadan Jasmin Traditional Red/ Multi Rug - 5'3" x 7'6"
The perfect decorative centerpiece for any room can be found in Safavieh's Vintage Hamadan Collection. Classic motifs are vividly displayed in distinctive hues and finished in an antique patina. Expertly power-loomed of enhanced polypropylene for virtually no shedding, this collection of rugs can withstand high-traffic areas of the home with ease. Dimensions 90.0 In. X 63.0 In. X 0.5 In. Really, for the price, I was shocked at how good this looks and how deep the pile! I have some real Persian rugs I bought in the 1970's and they were old then, so I know something about how real rugs look. My little companion dog passed away and after a year of being distraught, I got two puppies so that I would have joy in my life again. I bought several of these rugs to put down while I stored my "real" rugs so that the puppies would get used to rugs and would learn that they were not pee pads, chew sticks, nor were they outside grass. I also wanted them to have cushioning and traction while running; not a bare, cold floor. These have been warm and very, very plush and pleasing to look at! Tough and washable, they have worked to a tee and, a year later, I am still using them scattered about with my other rugs. I think if there were fringe on these, they might fool some novice aficionados! I highly recommend these because they are amazingly plush and soft with a lot of pile, they are very attractive and warm and the colors and patterns are very appealing and harken back to the authentic tribal patterns. They are tough as nails, too. These are an incredible value! This is my second Safavieh rug and I love it. Goes perfectly in my dining area. Great quality for the money. Highly recommend it especially if you are trying to add color to your room. Beautiful rug it's a great addition to our home ordered 3 different sizes great quality . I’ve ordered many rugs from overstock and this is the first I had to return. I was excited about it because it was advertised as vintage look. Pattern is vintage, but pile and color we’re not. Colors very bright. Red almost looked orange. Photos are not representative. I wanted a modern/eclectic/bohemian rug for my home. After purchasing several distressed rugs and taking them back, I found this one and couldn’t be happier!! The colors are exactly as pictured and the quality is great especially if you order a felt rug pad to go with it. My husband never comments on any of the decor for our home, he even loves it. The rug design and patterns are almost as pictured. The only difference is the the the tan portions are a bit darker than the picture but I didn't mind. The rug has nice plushness to it when you walk on it barefoot. The colors are more vibrant than pictured. The "distressed" look makes the rug seem uneven in places but I enjoy the effect. Would definitely buy again. Nice rug but some areas of weaving with color irregularities. Used colored sharpies to fix improper color pigmentation. I'm a perfectionist. Beautiful; excellent quality for the money. Very happy with our purchase. I think it is slightly more distressed than it appears but that works perfectly for our home. We put this in our master bathroom. We have black weathered cabinets and white walls. The rugs add the perfect amount of pop/color! Fun rug! Looks just like the picture. Good quality for the price. Love the faux “old” look they are doing on these rugs. I love the color of this rug! It came quickly and is more plush than I imagined, which is great. We're ordering our second one now for the living room! Great area rug! Looked exactly like the picture. It makes the room feel warm and inviting. It's the perfect bold rug, the design is really beautiful. Beautiful in our southwestern room! Purchased 3 different sizes!!! Beautiful and plush feeling to your feet!!!! Love this rug. We got it for a sitting porch which isn’t dressy or formal. It brightens the area up wonderfully. We laid it over a wall to wall carpet and it is nice and cushiony to walk on. Some of the flecks of color that make up the pattern are odd gaudy dots that are peculiar. That said, you’d have to bend over and put your head about two feet from the floor to notice that phenomenon. Great buy! Beautiful rug, good quality, but the red in this rug is bright cherry red. Not exactly what I was expecting. The actual rug is even better in person! It hides any spills and stains really well and I can use my roller chair in the office over it without a roller mat. The rug is made of polypropylene and will not shed. "You say that the returns have to be un-opened for a full return. How can I know if the item (a rug) would fit/look good in my living room if I don't open the package? If it doesn't look good, I won't get my money back because I opened it and put it down on the floor where I wanted it????" We inspect all returned items and award a partial refund for opened or used products. If the return is a result of our error or defective product, we will refund the full cost of the merchandise and shipping charges. So this means that if I buy a carpet from you I cannot open it and roll it out in my room to see what it looks like and how it fits without being charged for that??!! I'm not talking about walking on it or keeping it on the floor for days, just to see what it looks like. You're going to deduct from my return for that?!! That's crazy! I've never heard of that!!!?? Is that REALLY what you are saying? Please respond in your own words, please do not paste from you standard statements. Thank you. "What is your return policy? Do you have free returns? If not, how much does the rug weigh? Thanks"
The shipping weight is 24 pounds. You can initiate a return for most new and unopened itemswithin 30 days of delivery for a full refund. * You must return items in new or unused condition with all original materials included with the shipment. We must receive your returned items at our processing facility within 45 days of delivery (see Product-Specific Return Policiesfor exceptions). We inspect all returned items and award a partial refund for opened or used products. If the return is a result of our error or defective product, we will refund the full cost of the merchandise and shipping charges.